Navy Chief (Ret) and Graphic Artist Jeff Hobrath’s unique artistic style is unmistakable and evident in everything he creates, whether it’s illustrations, technical drawings, web sites, page layout, cartoons, or logos. 30+ years experience as a leader and senior graphic artist in both government and commercial environments. He thrives on all things creative. Although Jeff loved being a young artist, his childhood dream was to serve in the United States Navy. So Jeff joined the Navy in 1981, at the age of 17 and shipped off to bootcamp in February 1982. An interesting career in the Navy to say the least. Most of Jeff’s military service revolved around Naval Aviation, specifically Aviation Life Support Systems (ALSS) dealing with Aircrew Survival related issues and equipment on America’s most advanced weapons systems including carrier based aircraft such as the F-4 Phantom, F-14 Tomcat, A-6 Intruder, EA-6B Prowler, F-5 Tigershark and F/A-18 Hornet. He also served extensively in the Naval Security Forces, graduating from the Naval Special Weapons and Tactics Academy at Naval Air Station Miramar in 1987 and becoming a member of the Crisis Response Force, an Anti-terrorist unit which supported various specialized security operations. He served in various commands and duty stations including Recruit Training Command Great Lakes Illinois, Naval Air Technical Training Center Lakehurst New Jersey, Naval Air Station Miramar Califronia, Naval Air Station Glenview Illinois, Naval Air Station Joint Reserve Base Willow Grove Pennsylvania, Fighter Squadron Twenty One (VF-21), Fleet Logistics Support Squadron Five One (VR-51), Fleet Logistics Support Squadron Five Two (VR-52), the aircraft carriers USS Constellation (CV-64) and the USS Coral Sea (CV-43). Deployed around the world several times in various operations. While stationed at NAS JRB Willow Grove, Jeff was selected as “Sailor of the Year” and promoted to Chief. During his 20 years of service in the Navy, he never really stepped away from his artistic talent. Jeff honed is creative skills at each command he served, always being asked to draw or paint something on the ship, the squadron walls, or cartoons of the crew. He even painted the sides of a few aircraft reminiscent of WW-II aircraft. Jeff became a very popular artist where ever he was stationed. Later he turned some of his designs into a household name brand “NavyChief.com”. Jeff founded NavyChief.com and parent company NavalTees in 1997 and served as CEO, President, Art Director, Artist and Web Designer for the next 15 years building it into one of the most popular military related brands in the world. His creativity, expert design and keen sense of humor made Jeff’s work a favorite among the troops and today he stands as one of the most recognized military artists of all time. Jeff was the first person on active duty to become an Adobe Certified Expert (ACE) in Photoshop. With a 20 year military career and countless moves across seven states, Jeff finally retired from the Navy in 2002. After retirement from the service he worked in various creative roles including Creative Director, Art Director, Senior Graphic Designer and Web Designer for a vast array of commercial clients, government organizations and defense contractor’s, which included graphic design services in support of Naval Air Systems Command (NAVAIR) at Naval Air Station Patuxent River Maryland and other military commands around the globe. In 2006 Jeff was selected as the Navy Historical Volunteer of the Year by the Navy Historical Society at the Washington Navy Yard, Washington D.C. His popularity among the troops was even recognized by a personal invite and private behind the scenes tour from the White House. Working with Jeff through this process has been an amazing experience! He has killer idea’s and the skills to match! I can’t wait to see what he comes up with next. This is a very exciting time for the FDVG and our members. Having these images printed where we can wear them proudly in our communities is a vision come true. 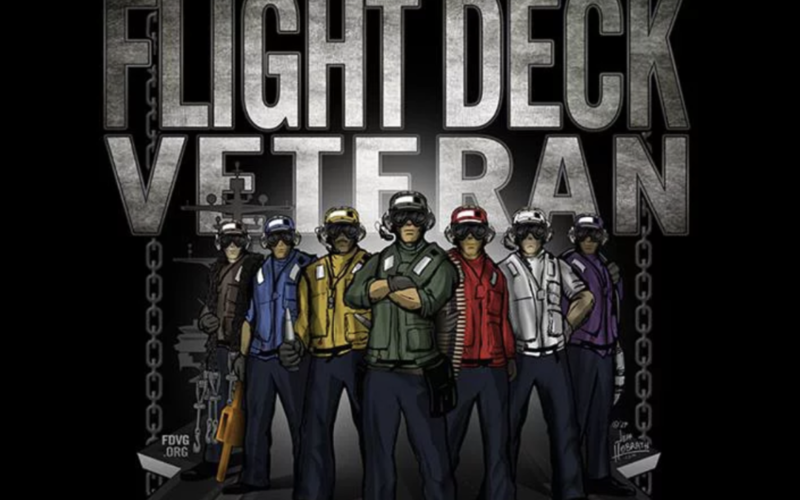 Thanks Jeff for your time and talent but most of all thank you for being a Flight Deck Veterans!